Zoo Station by David Downing, a Mysterious Review. Review: Although born at sea of an American mother and an English father, 40-year-old freelance journalist John Russell has been living in Germany for almost fourteen years, long enough to have married, and divorced a German wife, Ilse, to have had a soon-to-be 12-year-old son, Paul, and to have found a long-time film actress girlfriend, 32-two-year-old Effi Koenen, an acquaintance of Lenni Riefenstahl's. They all live in the Berlin of 1939, but far from happily ever after, as war clouds gather and Nazi thugs scorch the lives of Russell's Jewish friends, the Wiesners. David Downing's story of journalist Russell's struggles to rescue the Wiesners from annihilation and save his own skin in the process is a compelling mix of murderous cover-ups, espionage and counter-espionage, historical facts, and one man's courageous determination to rebel against evil incarnate. On the surface Downing's novel is a straightforward enough story about a journalist caught unwittingly in a sticky web of espionage. For a substantial sum of Reichsmarks freelancer Russell agrees to a proposal from a long ago acquaintance in the Russian Communist Party to write "a series of articles about positive aspects of the Nazi regime" – a slippery slope for Russell given his observations of the kindertransport of Jewish children, the pillaging of their homes and the fatal beatings of their relatives in the Sachsenhausen Concentration Camp and Re-Educational Facility. Conflicted between being a well-paid propagandist for the Russian party's purposes and what he sees around him, Russell questions how to maintain his integrity as he journeys back and forth from Berlin's Zoo Station to clandestine meetings outside of Germany with his Russian contacts. Threatened with exposure to the Germans, he agrees to spy for the Russians while secretly spying for the British as well in exchange for visas for the Wiesners after their father, a medical doctor, has been arrested on false charges and beaten to death. To increase the danger to his own safety he partners with an American journalist, Tyler McKinley, who is researching an expose of the Nazis' plans to euthanize mentally slow children. When McKinley dies at the Zoo Station in a murder covered up as a suicide, Russell inherits the documents for the story and the lead to a critical letter proving the allegations. His troubles compound as he balances his espionage efforts between giving the Russians what they want, providing the British with worthwhile information, getting the Wiesners' visas, driving the hot-tempered 18-year-old Albert Wiesner out of town and escorting the widowed mother, Eva, and her two teen aged daughters to the relative safety of the Zoo Station for their trip to freedom on "the long train as it rumbled across the iron bridge and leaned into the long curve beyond." Although not on the macro scale of Schindler's List, Downing's novel is nevertheless a gripping story of bravery and, at times, crackling suspense, especially during interviews with the Gestapo and searches by customs agents. The references to the personas of the day and the landmark settings of the cities and countries bring the story alive and the summaries of speeches and historical documents reinforce the chilling authenticity of the Nazi controlled state of pre-war Germany. Russell's inner and external conflicts are well depicted as are his relationships with his son, his girlfriend, and the Russian, German and British officials he must deal with in his trade of documents for money and lives. 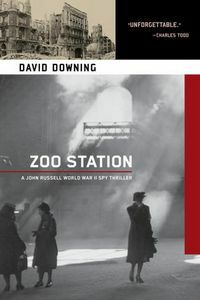 Even the Zoo Station comes alive as the focal point for much of the story as the site of the alleged suicide and the repository for a suitcase with a hidden compartment, a piece of luggage that in the end leads ironically to Russell making a major contribution to a "wedding present" for a customs official with an agenda of his own. Special thanks to M. Wayne Cunningham (mw_cunningham@telus.net) for contributing his review of Zoo Station. Acknowledgment: Soho Press provided a trade paperback edition of Zoo Station for this review.